My fraternity owns a 100 year old house and it’s starting to show its age. We are an 80 man chapter and growing, but this will come to a halt if we don’t figure out a way to build a new house; Since 3 fraternities are building new houses now and 2 more are scheduled to be built by 2016. What are some ways we could finance a new housing project? We have a limited alumni base because we were not on campus from 1970 to 1995. And our International office doesn’t finance new chapter facilities. Are there any proven ways to fund raise quickly? Via alumni and undergrads. Would partnering with a developer be beneficial to us? What are some other ways we could get this project underway in the near future? 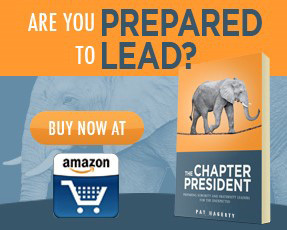 Thank you, and ‘The Fraternity Leader‘ was an excellent read, and was my bible when I was chapter president. First off, I am glad you liked The Fraternity Leader. It is very rewarding to hear comments like yours. I do appreciate it. Your situation is a tough one. Unfortunately, there isn’t a blanket answer that will lead to a new house. Every situation is different. 1) The very first thing I would do is inform the alumni of your need, and let them know you are starting a fundraising campaign for a new house. Send a newsletter and include pictures. Explain how the situation is eroding your competitive advantage on campus. Let them know you will be asking for their help later. You just want to make them aware of what you are doing now. 2) Next, I would increase dues $50 a man per semester. Fifty bucks isn’t a lot of money, but it will be a quick infusion of cash into the project. At your current size, this will lead to $8000 a year. Be sure to put this money in a completely separate bank account that is ear-marked as the house fund. I would make it so that withdrawals on this account can only be made with the cosignature of the president of the alumni association. The last thing you want is the chapter raiding the account to throw a party a few semesters from now. And if the brothers aren’t willing to cough up an extra fifty bucks a semester, I question how badly the chapter wants a new house. 3) I would host a fundraiser per semester where the proceeds go to this account. I have listed a ton of great fundraising ideas on the site, so I won’t dwell on potential ideas. However, I want to reiterate the cardinal rules of fundraising. First, make it fun for brothers. They have enough things in their life that is a drag. Don’t make fraternity a drag. Two, maximize your strength. For most of you, your social program is very strong. Use your social program to fundraise for you. Three, maximize fundraising opportunities at things you already do – like eat. See this article for example: Moe’s Fundraiser. 4) Take care of your own business. Do you have brothers who owe back dues? Holding them accountable may be the best and quickest fundraiser your chapter can have. Do you have brothers on your national/school roster who are no longer part of the chapter? It doesn’t make sense to pay for these guys if they are no longer part of the chapter, so be sure to remove them..
5) Continue to grow. More brothers means more revenue for your newly created house fund. More brothers also means bigger fundraisers. Growth is probably the #1 sign for a strong chapter, and your chapter has to be strong to accomplish a project like this one. 6) Take care of your current house. If you don’t take care of the house you have, you cannot expect your alumni to give you a new house. I realize your current house is old and not in the best shape. However, by showing you have respect for what you currently have it will show your alumni that you can be trusted with a sizable investment. 7) At this stage, you will have raised about $25,000 – $50,000 in your house fund. A sizable amount for sure, but not enough to get a new house. You will have proven that you are willing to help yourself – a huge step when you ask others for help. This is when you go to your alumni to take your campaign to the next level. 8) Send another newsletter to your alumni and inform them of where you are in your campaign. Explain to them you will continue to do the measures in place, but you need their help to make your dream a reality. Ask if any of the alumni brothers would be willing to participate in a meeting to figure out what the next step should be..
9) Hopefully, at this meeting you will get a few alumni who can help with the second stage of this campaign. Let them take the lead. There are several benefits to getting the alumni to take the lead. Obviously, they will have an easier time recruiting other alumni to help support the campaign. Also, undergraduates are not in college for a long time. Four or five years may seem like a long time, but it really isn’t. For the sake of continuity, it is essential that someone is part of the program who won’t disappear once they graduate. Finally, when it is time to pull the trigger an actually buy the house, this is something that should be done by your housing corporation – an alumni based organization. 10) If you get to this stage, congratulations. You have done a hell of a job as Chapter President. You will have left your legacy on your chapter, and YOU will be remembered for years to come. Remember though that something of this magnitude is never accomplished by one person alone. Be sure that those who were especially instrumental in the campaign are continually recognized for their efforts. This is especially true for the alumni that were involved. To recap, the chapter has to prove that they are willing to help themselves before they should consider getting the alumni involved. However, if you can prove that you are serious about this fundraising campaign, a motivated alumni group can make a new house a reality. You could also petition your student organizations to work together with the University to build new Greek housing. This just happened at Arizona State University where I believe 27 houses were just built for Fraternities and Sororities. Granted that’s a very unique case, but it’s another option. My chapter at ASU is one of the lucky ones to be in the new Greek Leadership Village. I’m an alumni now but still very involved with my local chapter. I even started a company to provide my brothers access to higher quality menswear at lower prices than traditional retail stores. I wonder if he could find an alumn in the construction biz to advise him on fixing up his current house? At least get some bids and have some choices.